Railpictures.ca - Paul O'Shell Photo: This ex-VIA Rail LRC locomotive has undergone major modifications at the Diesel Electric Service shop in Sudbury, ON. Originally destined for Nouvelle Esperance in South Africa, the project never left Nickel Town. Note the narrow gauge trucks. Diesel Electric Service shares the former CP car shop in Sudbury with fellow railroaders Huron Central Railway and Canadian Pacific Work Equipment. | Railpictures.ca – Canadian Railway Photography – photographie ferroviaire Canadienne. Copyright Notice: This image ©Paul O'Shell all rights reserved. 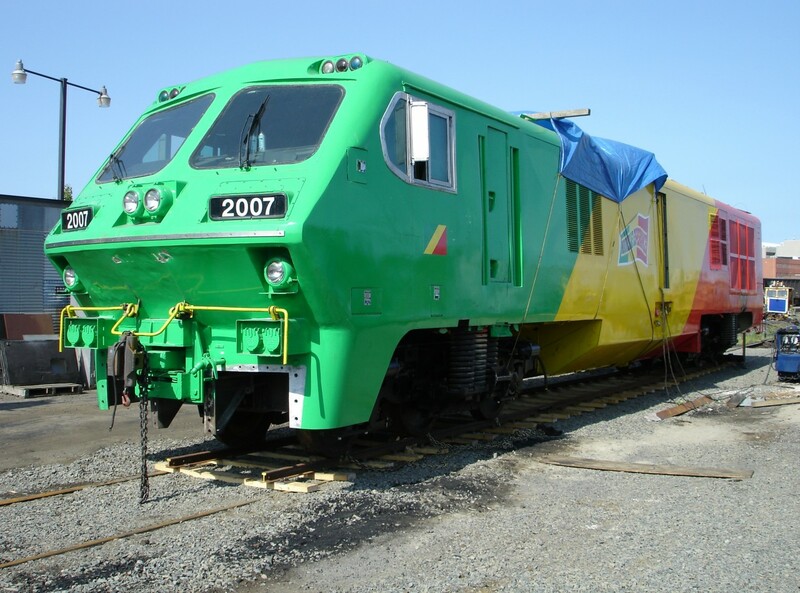 Caption: This ex-VIA Rail LRC locomotive has undergone major modifications at the Diesel Electric Service shop in Sudbury, ON. Originally destined for Nouvelle Esperance in South Africa, the project never left Nickel Town. Note the narrow gauge trucks. Diesel Electric Service shares the former CP car shop in Sudbury with fellow railroaders Huron Central Railway and Canadian Pacific Work Equipment. After comparing some body dents and spotting details, this one should be ex-VIA 6903, with the other grey unconverted one 6905. To my knowledge, Nouvelle Esperance 2007 still sits unfinished on its narrow guage perch at the DES facility in Sudbury. I will check on this during my next visit to CP and Huron Central. Great to see photos of things I have never heard about. What has become of this unit?